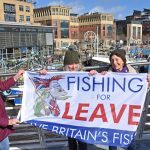 Brexit campaign group Fishing for Leave (FFL) said, following the demonstration, that fishermen and fishing communities were ‘enraged’ at the capitulation. 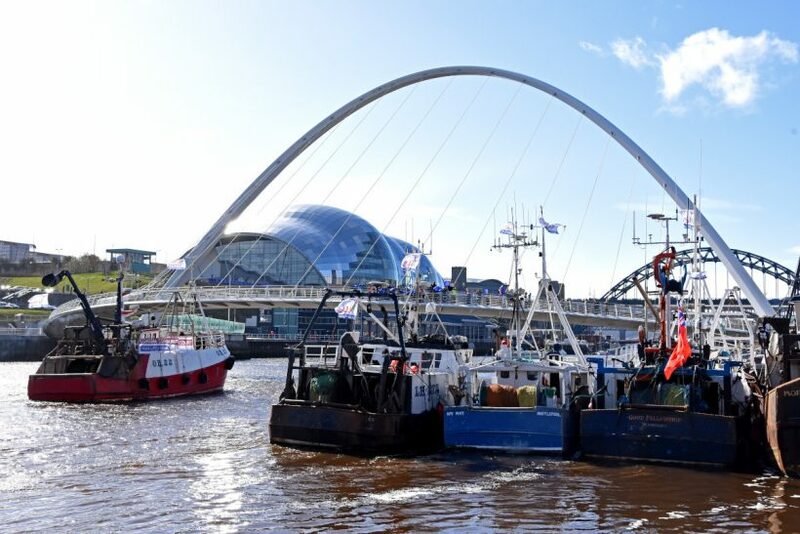 Trawlers berthed on Newcastle quayside, downstream of the iconic Millennium and Tyne bridges. 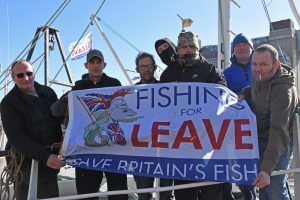 Aaron Brown of FFL said: “We hope our contribution helps to inspire all patriotic Britons to make a noise demanding that MPs must listen, and not thwart or betray Brexit or Britain by voting through Theresa May’s ‘Brexit-in-name-only’ withdrawal agreement, or postponing/cancelling a democratic instruction. 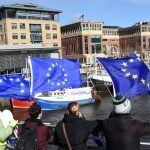 FFL said that, under the terms of the withdrawal agreement, the government has agreed to re-obey all EU law post-Brexit for a two- to four-year transition period. 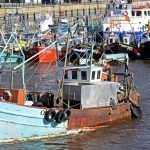 It highlights that this means that the already-struggling industry will remain trapped in the disastrous CFP until possibly January 2023. 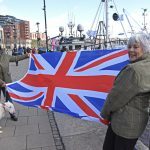 The group highlights that under the withdrawal agreement terms, the UK will be excluded from EU decision-making, but will be bound to obey all new EU rules. 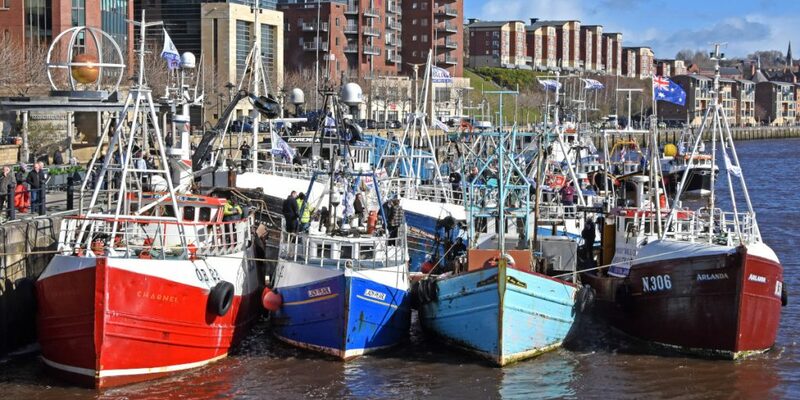 FFL says this would allow the EU ‘to enforce any detrimental laws to cull what is left of Britain’s fishing industry’. 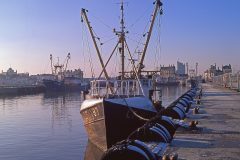 It says the EU would be free to slash Britain’s quotas, abolish the 12-mile limit, and trade UK resources in international deals. 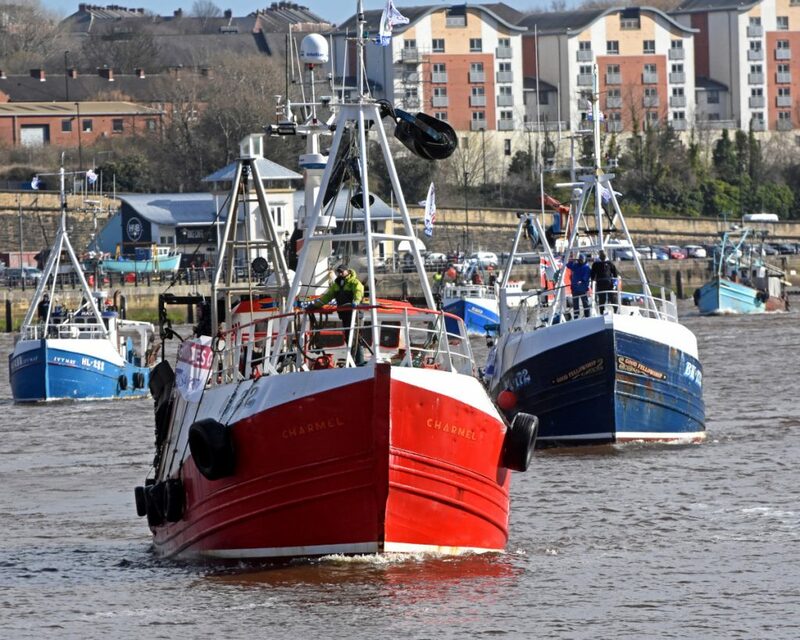 Trustful, Emily Rose, Palatine, Innisfallen and Ocean Provider rafted five out. 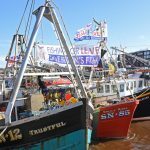 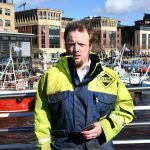 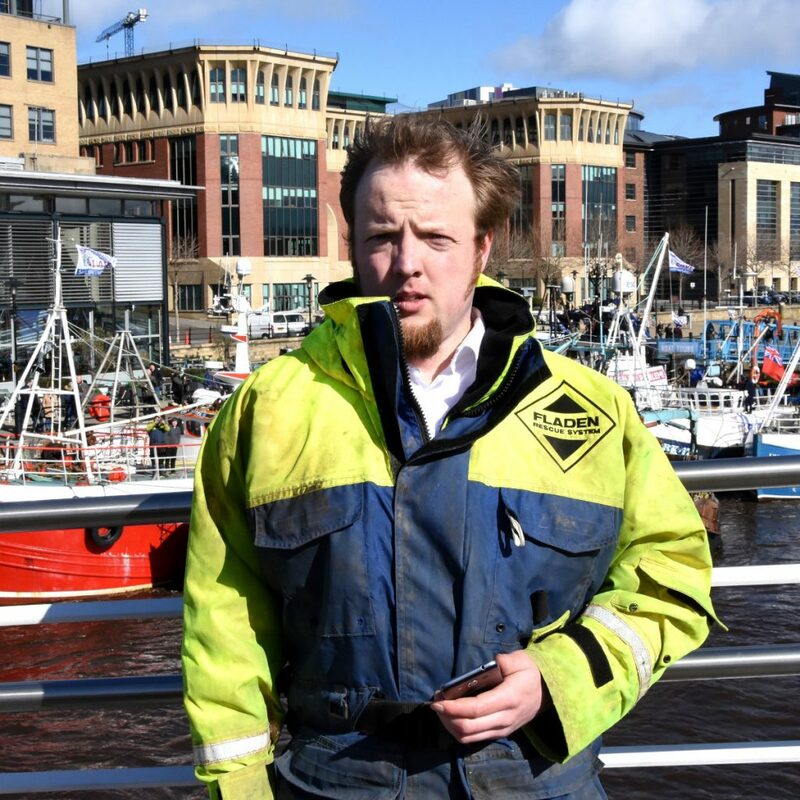 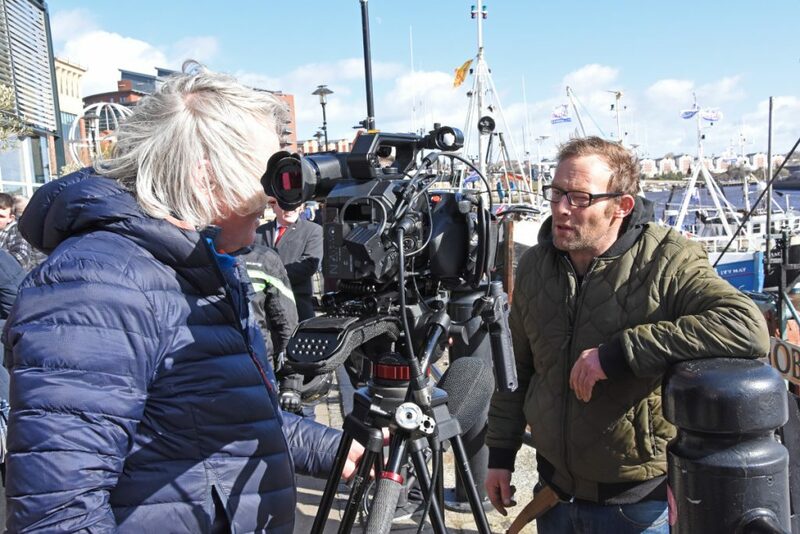 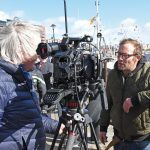 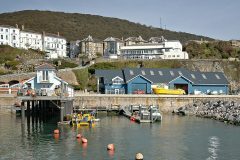 “Of particular horror to British fishermen is that the withdrawal agreement would mean that the EU can demand full enforcement of the EU discards ban,” said Aaron Brown. 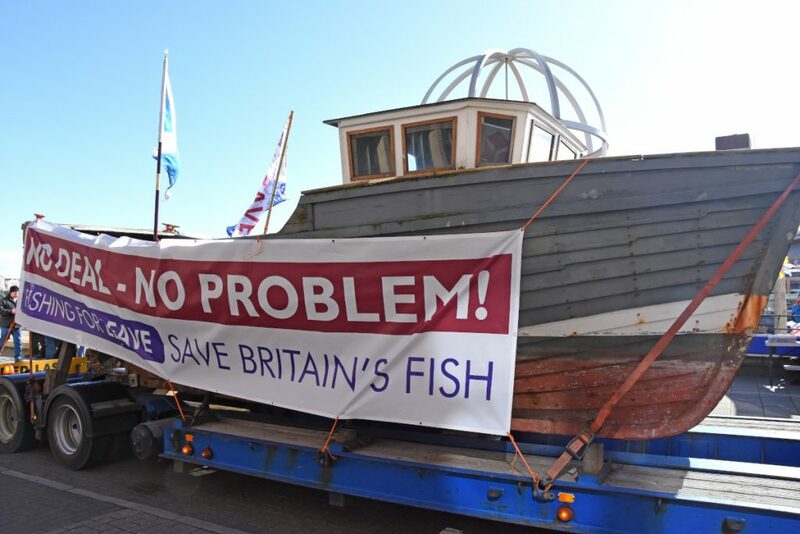 “The EU has every incentive to enforce any and all detrimental legislation to cull what’s left of the UK fleet. 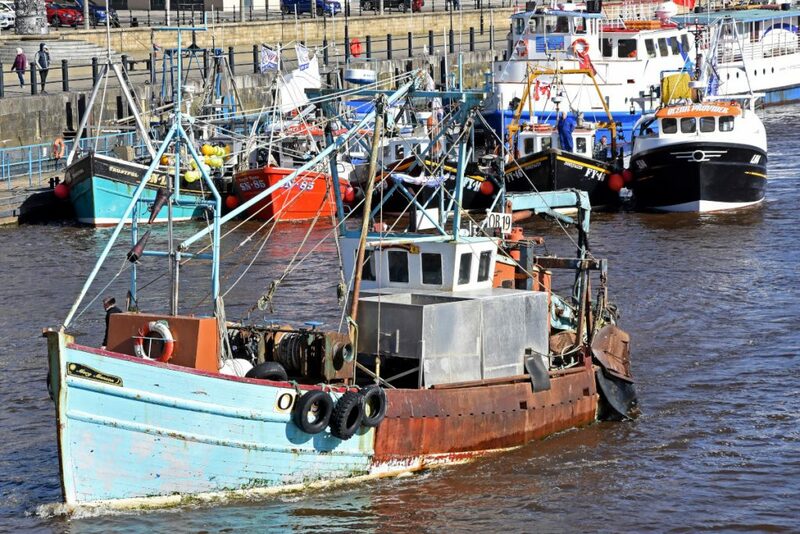 Under international law, if we no longer have the fleet capacity to catch our own resources, the EU can then claim these resources using international law under article 62.2 of UNCLOS. 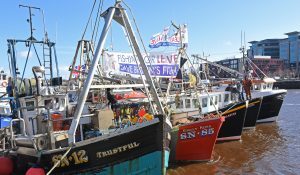 Local and visiting crew show their support for FFL. 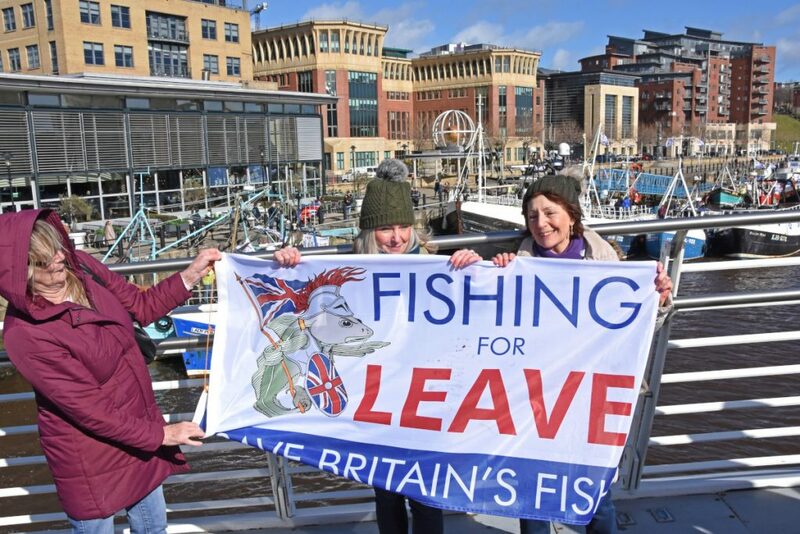 FFL also points out that if Britain won’t agree to EU demands, then the EU can invoke the ‘backstop’ – severing Northern Ireland from Britain and trapping Britain as a permanent EU rule-taker. 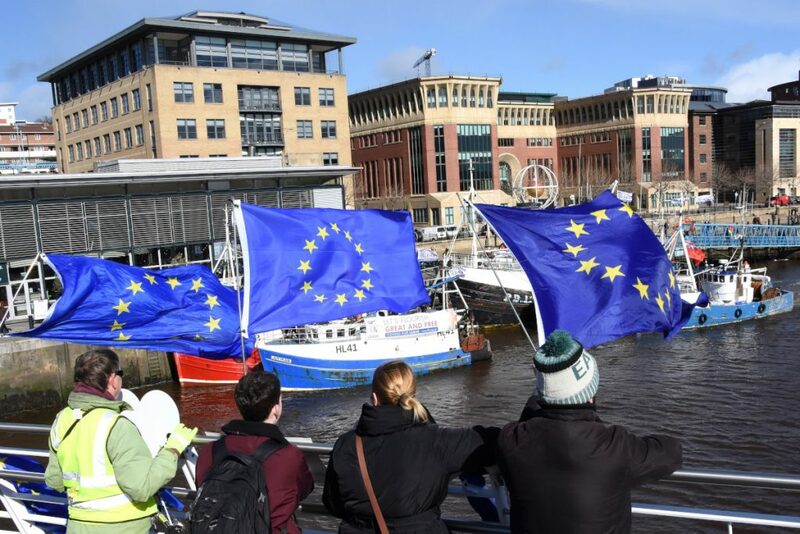 Britain can only escape by agreeing to the EU’s ‘future relationship’ terms. 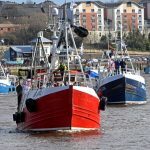 The backstop also says that if the UK won’t yield on fisheries, then the EU will close its markets. “The withdrawal agreement is a total turkey trap, where the EU can force Britain into CFP associate membership forever,” said Aaron Brown. 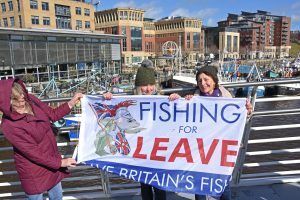 “It is not much better for any other part of our nation. The withdrawal agreement puts Britain over a barrel, paying £39bn for the privilege, and then only to be forced into becoming a permanent vassal state under the draft future relationship. Lisa Tamlin and Anne Symonds, together with the English bull terrier Gerrard, made the long journey from Kirkby Lonsdale in Lancashire to support UK fishermen, and will be in Parliament Square on 29 March. 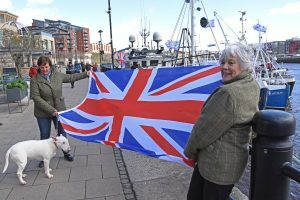 He called on all supporters to join the March to Leave, which will arrive in London on the withdrawal date of 29 March. 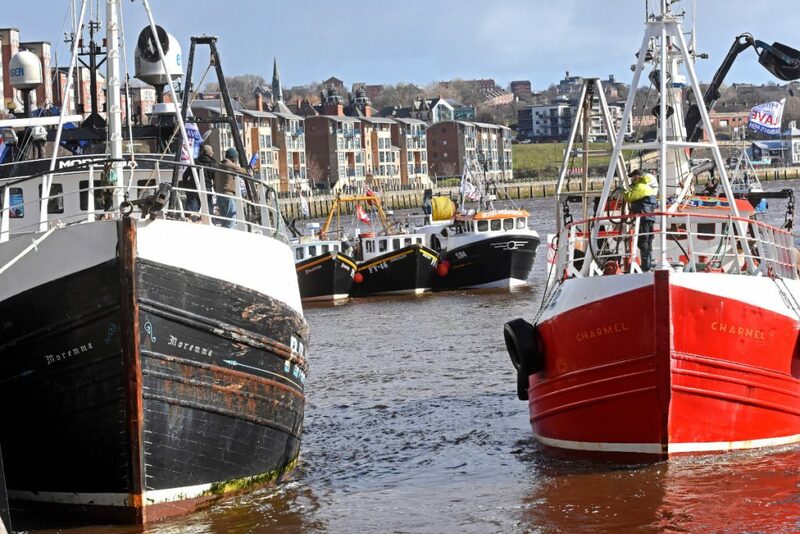 A 30ft traditional NE England coble mounted on a lorry, escorted by a pipe band, left North Shields harbour at 8.30am and arrived at Newcastle quayside at midday. 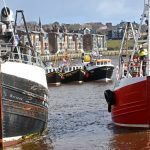 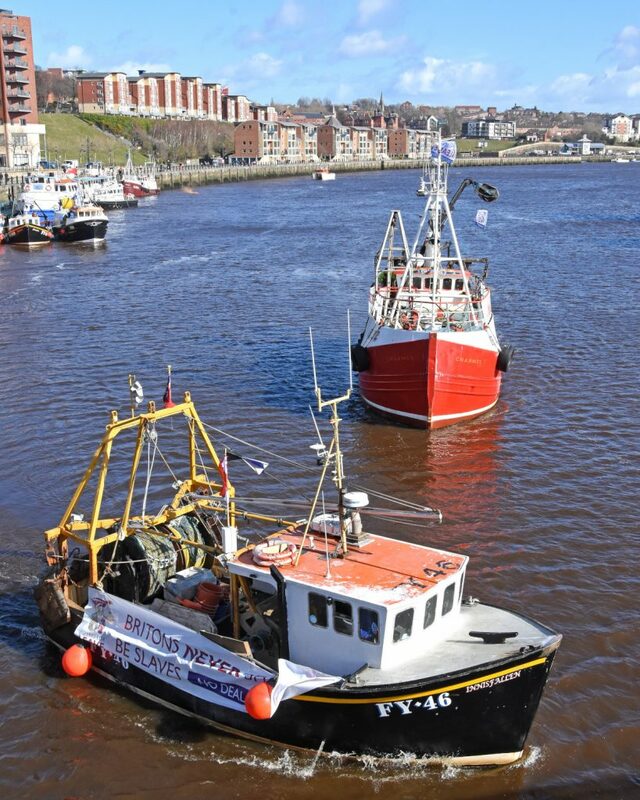 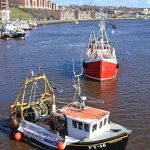 At the same time, a flotilla of some 20 fishing vessels left North Shields and headed up the Tyne to the Millennium Bridge, intending to join the boat, lorry and pipe band at Newcastle quayside. 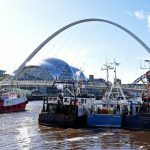 However, Gateshead Council decided not to open the Millennium Bridge as was scheduled, giving only five minutes’ notice before the boats arrived. 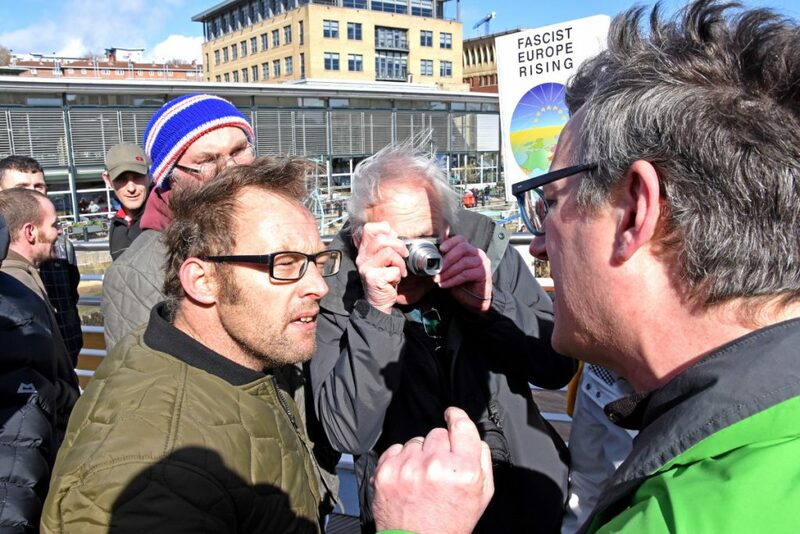 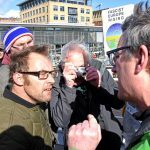 … alongside Leave supporters, which led to some lively debate. 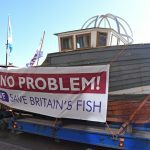 FFL said that the protest was conducted with dignity and professionalism, and gave ‘a huge thanks to all the boats that took the time, and made the effort, to raise the industry’s voice’. 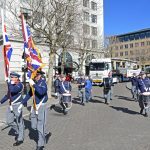 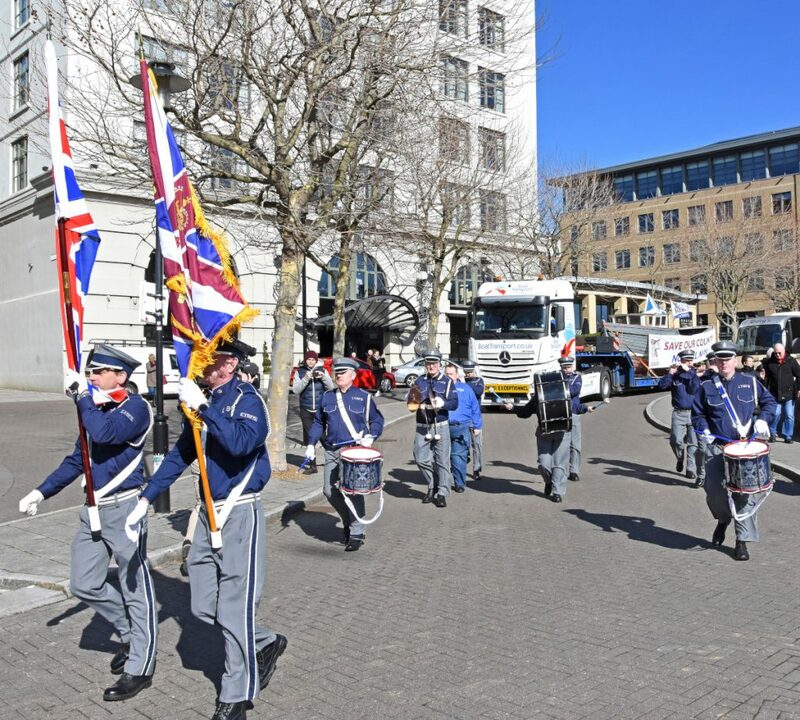 It also thanked the pipe band, the lorry and the traffic police. 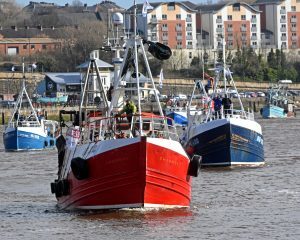 The coble was led across Tyne Bridge by the band before – in a historical nod – passing the Jarrow church from which, in 1936, Jarrow marchers started to walk the 300-plus miles to London, to highlight the plight of the working folk of Britain to the public and politicians (Fishing News, 21 March, ‘FFL organises Tyneside protest’). 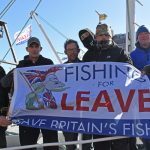 Richard Tice, founder and vice-chairman of the Leave Means Leave Brexit campaign group, which is organising the march to London, said: “We are delighted to have the support of Fishing for Leave, and thank it for its considerable efforts. 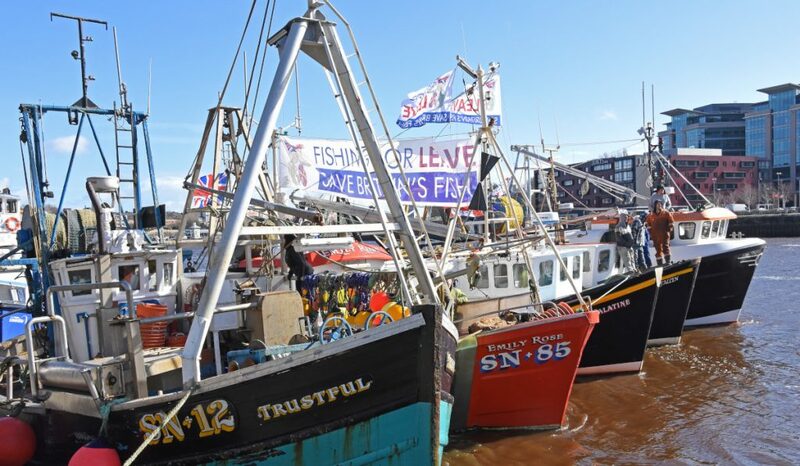 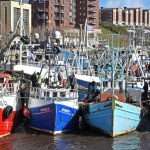 The UK fishing industry is a vital part of the UK’s economy and cultural heritage, and yet is being sacrificed, as the government yet again bows to the demands of the Brussels bureaucrats.